Had the day off today and the forecast was meant to be *clear* so thought this would be a good way of adding some more hills - 4 in one go can't be bad! 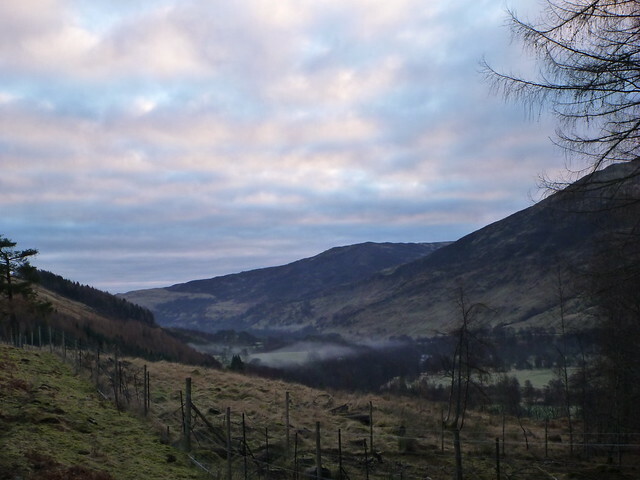 Got away from the house at 6.40 and encountered *fog* all the way up the side of Loch Lomond - though fortunately the roads weren't icy too. Some clear day this was turning out to be! 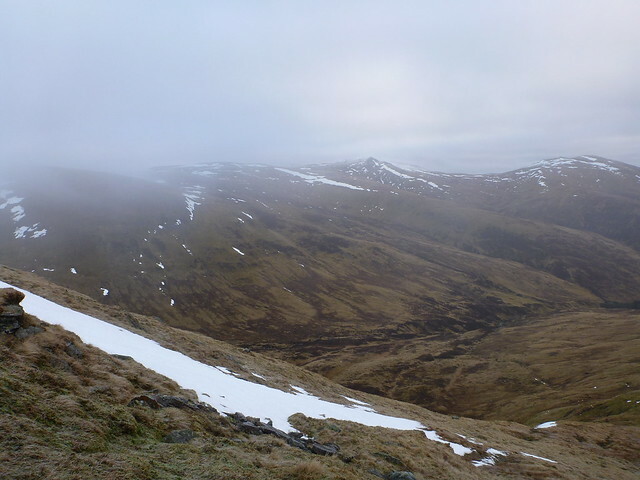 Anyway, after I turned off at Killin the fog lifted and it was quite a nice drive up to Invervar - was pleased to see that the single track road (which has quite a few blind summits) had been freshly gritted. Got to the phone box about 9, the only car there, and was out & on my way by 9.15.Had been worried that there might be areas shut for hind culling and hadn't remembered to phone in advance to check, but fortunately there was none of that going on - no signs up on the gate. and made my way along the forest path. The 3 gates are really stiff to bugde - for the 2 & 3rd ones you need to push downwards on the gate when you are trying to open the bolt, this makes it easier. Started following the wee burn, completely forgetting to cross the "ricketty metal bridge" - in fact I don't even remember seeing it and therfore instead of continuing left along the track following the trees, I was some way up the path along the burn before I checked my position and had a steeped climb up the hillside to join the path than I needed to have Once the *correct* path was located it was a steady pull up to the top of #1 - Carn Gorm. 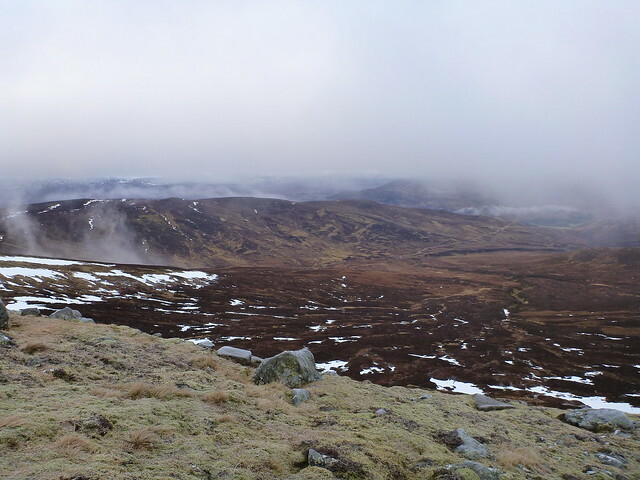 Although it had been clear when I started out, I could see the fog start to drape itself over the tops of all the hills in the circuit as I walked up CG - didn't really get any views from high up at all after that. 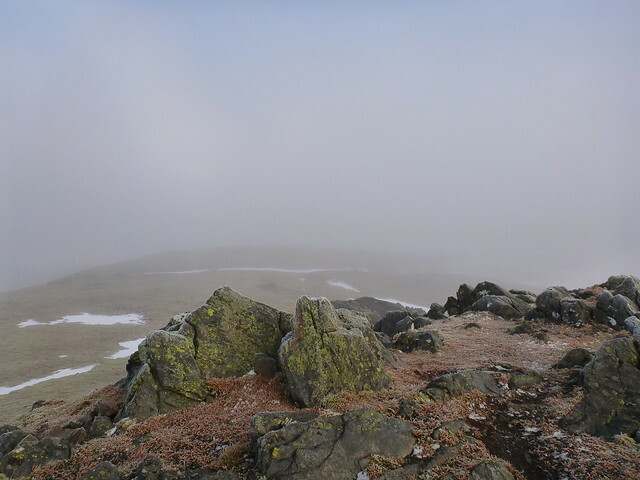 There was still a bit of frozen snow at the top but was able to walk in other folks footholes to avoid slipping (or having to get the crampoons out). I'd been roasted coming up, but was pretty chilly on top. Time to summit was about 90 minutes. 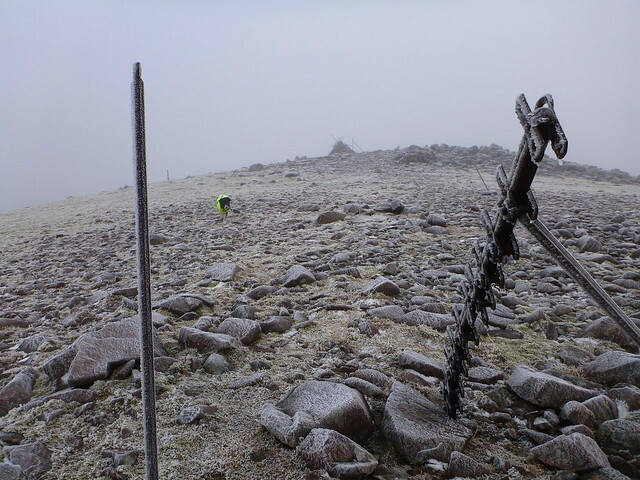 Not the weather for hanging about and I descended, remembering to turn L to head to Meall Garbh, not An Sgorr, then long the fence post marked track to the bizarre 1950's space junk cairn on MG.
Was even colder up on this one! 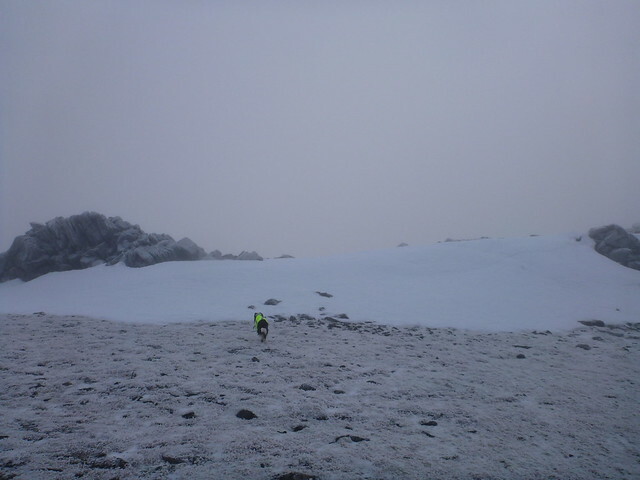 Had taken about 45mins from GC summit - thought about having a bite to eat but decided to press on. 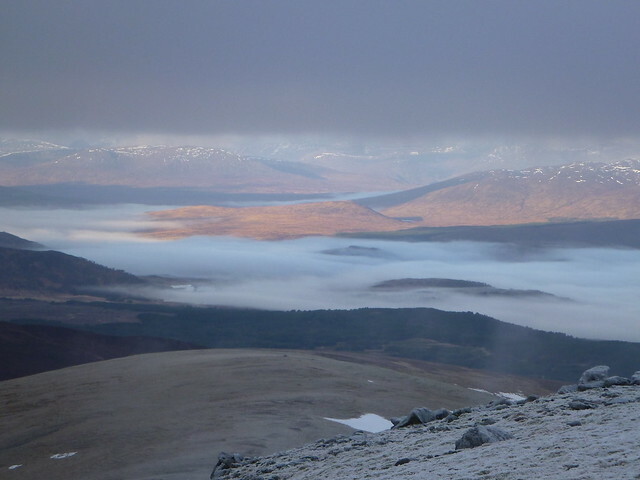 Had a brief clear moment when the skies suddenly opened up to the NW and got a wee bit of cloud inversion, but after no more than 3 minutes the clag closed in again. Was very little to see other than the inevitable fence posts, many of which were broken on the ground and posed a significant trip hazard. 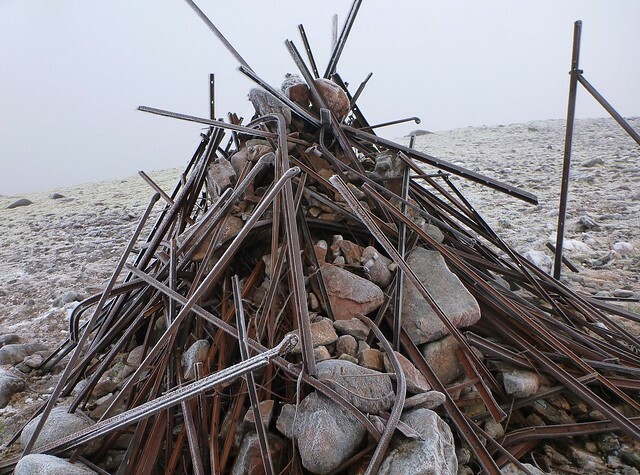 With the current scrap metal price, maybe some enterprising souls could come up and gather all the discarded posts and take them off to be melted down... 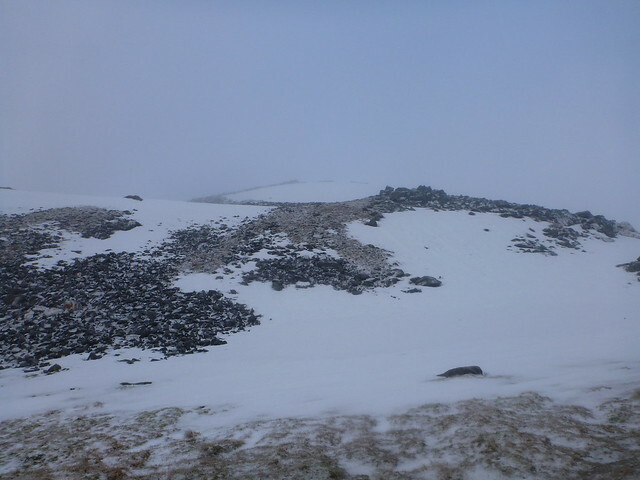 Headed on to Carn Mairg where the path got a bit stonier, still with sheets of snow in places. 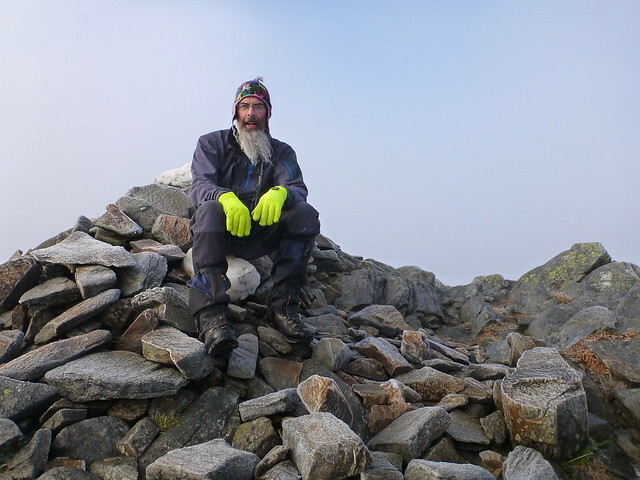 Almost missed the summit altogether, as I walked south of it and wondered why the path was descending rather than going up..
.tracked back and saw it nested amongst the boulders. 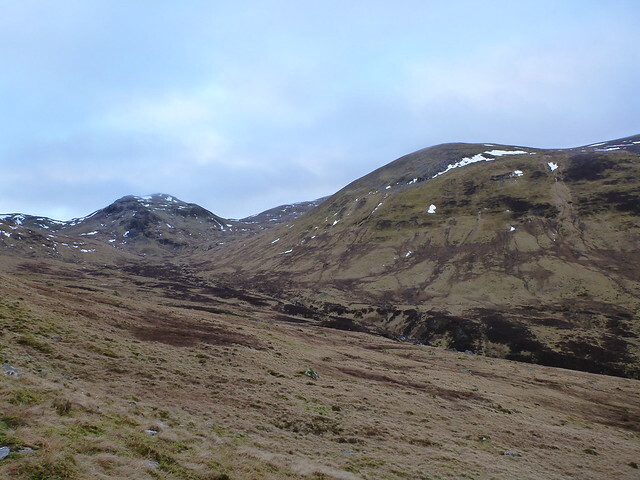 Next section was a flattish and moor-like plateau where the path was difficult to see initially but became clearer later on. 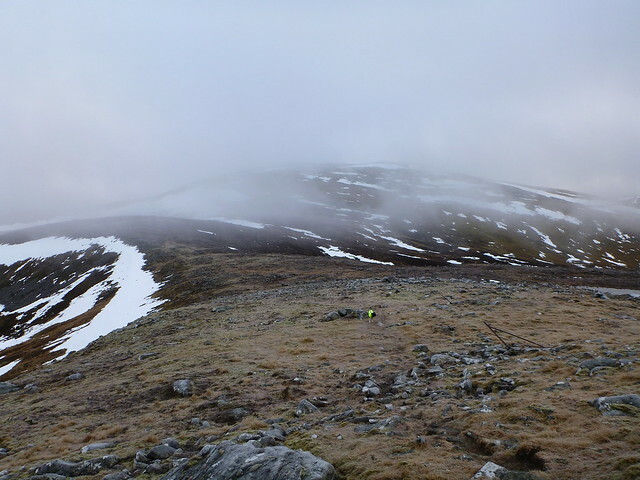 Could see the flank of Creag Mhor up ahead, vaguely through the clag - it took me about 50 mins to go from Carn Mairg to Creag Mhor - more snow in places and frozen streams running down the path. 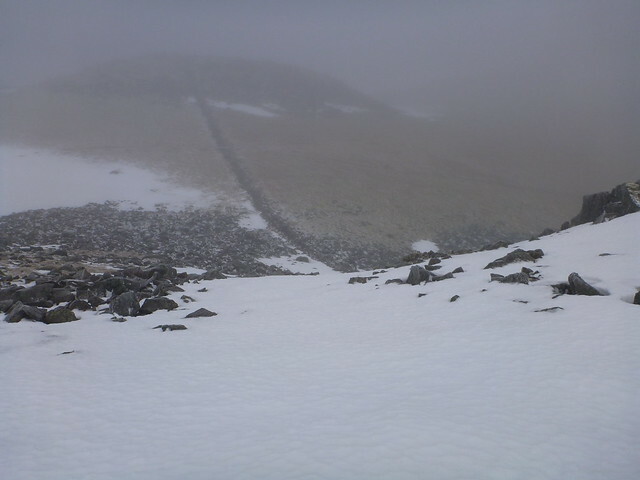 Thought I might have got a view from the top as the sun was definately brighter and warmer, but no..
.Took a bit of a wrong path which led me up to the adjacent summit at 974 of CM, had to track down to meet the proper path - in fact there were quite a few tracks going all over up there which wend their way in and out of snow patches. 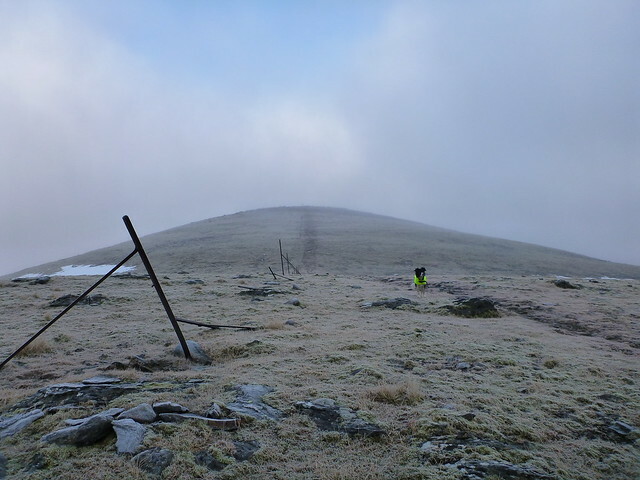 As I descended the clag was clearing. 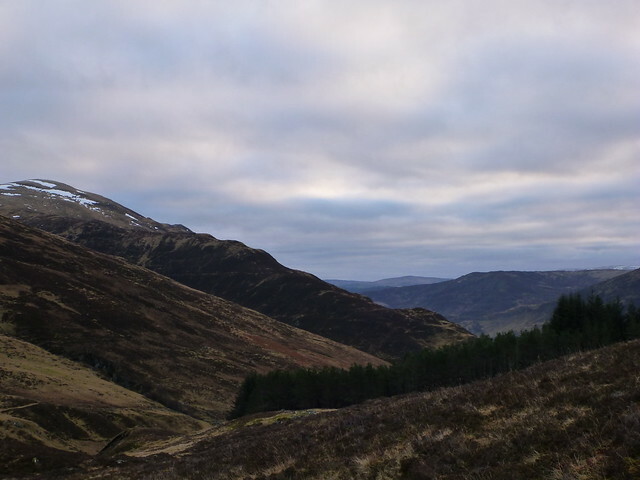 There was a steep rocky/muddy eroded section going down Roinn na Creag, which I found hard on the ankles Some nice views along Glen Lyon and the shoulders of the hills to the south of the glen. 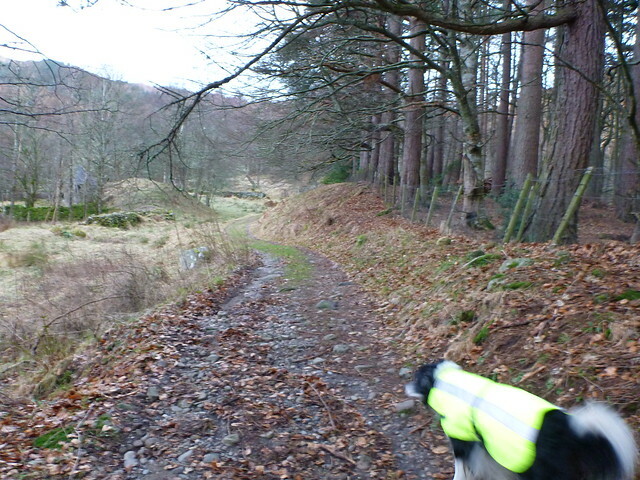 Eventually met up with the outward path at the forest gates and headed back to the car quite happy. 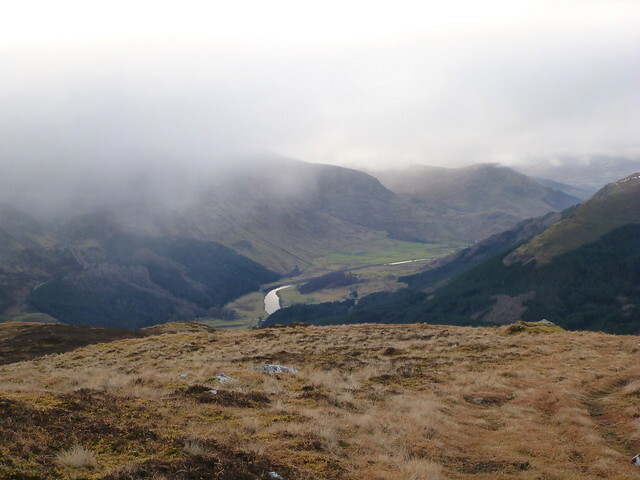 Well done good way to start the new year, some of my first ever hills on my round of munros. you can see the dogs still got the huff with you for forgetting the jumbone in pic 1000670!! 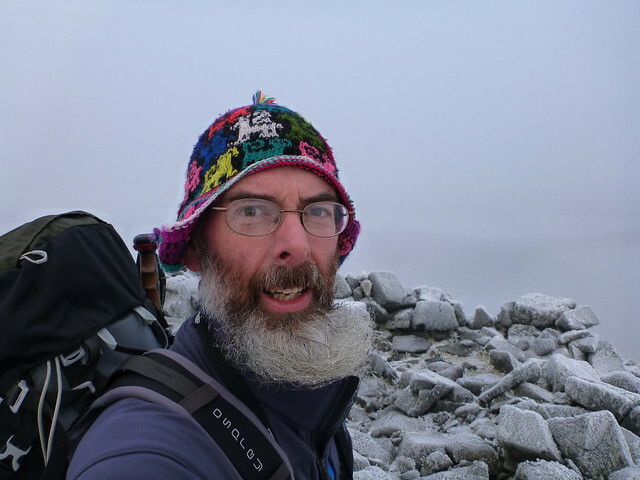 Re - THE HAT - my wife says I've got to point out that it's actually her hat which she bought from Peru via the wonders of the internet, but which doesn't fit her as her head's now too big! 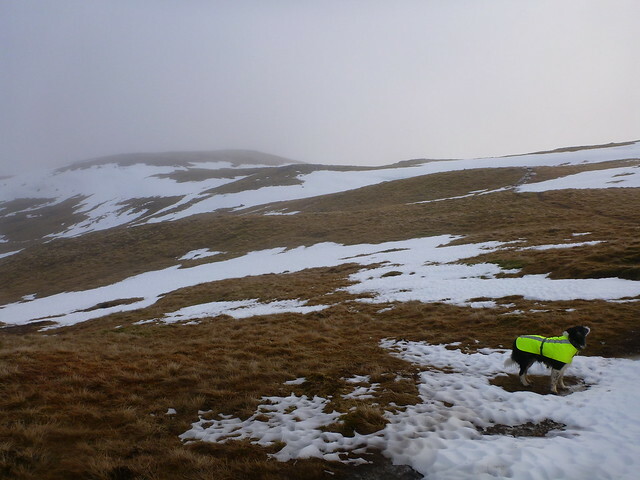 I agree it makes a good beacon for rescue, as do the bright gloves can never be too visible on the hills!! Random question - where did u get the dog coat? Waterproof? 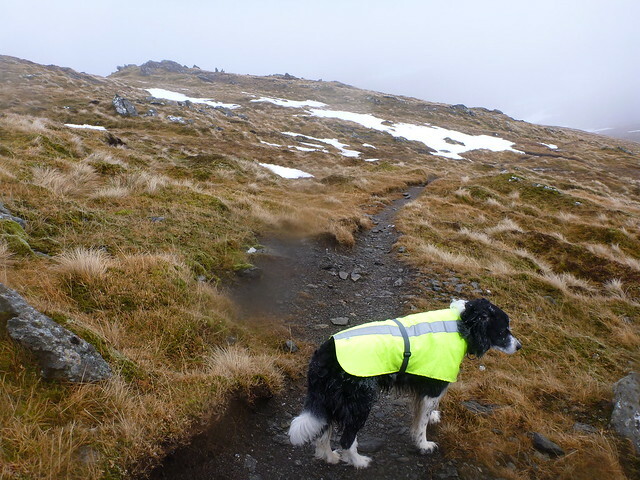 Eskimo wrote: Random question - where did u get the dog coat? 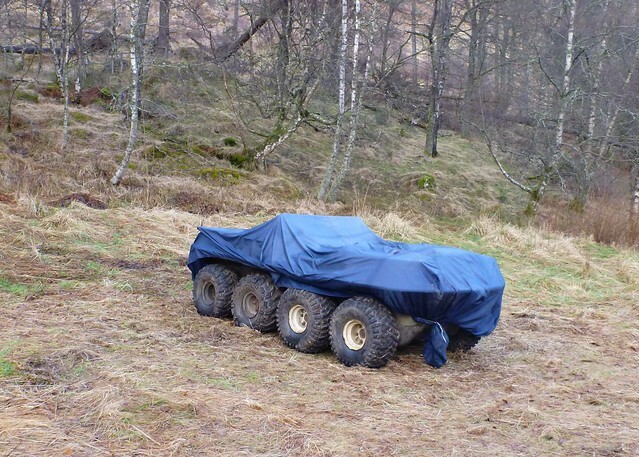 Waterproof? I'm pretty pleased with that coat. 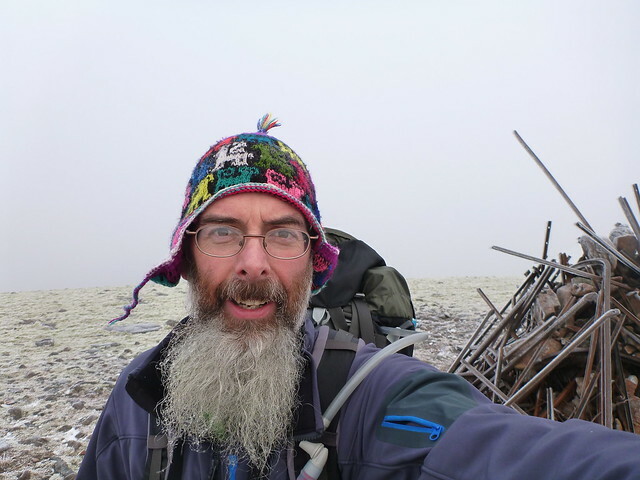 Know that disorientating feeling at the top of Carn Mairg; I did these 4 in heavy rain and next to zero visibility; got myself into a real tizz at CM's summit about which way to go. Thankfully I went the right way. 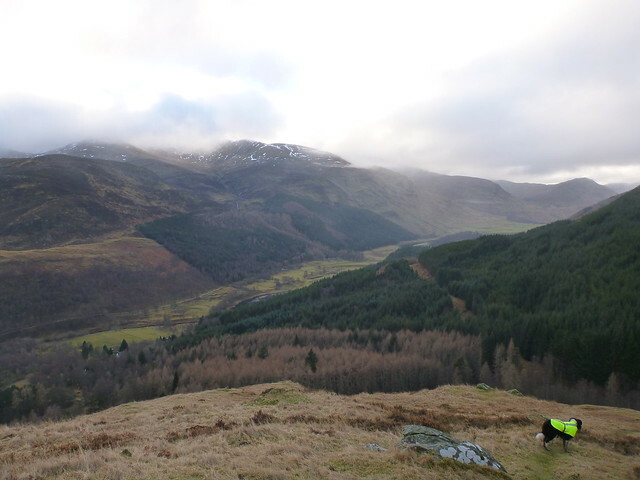 Might need to go back and do them again in decent weather to see the lay of the land. 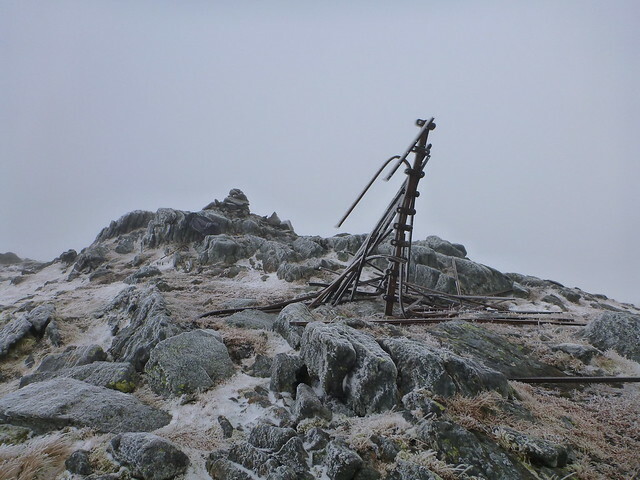 Some good pics you have despite the weather! 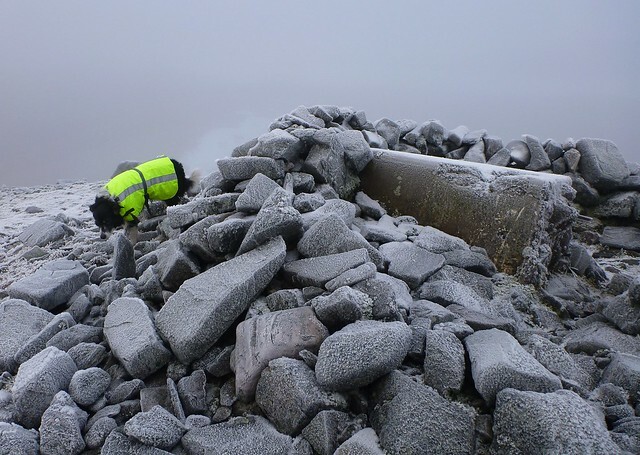 But the summit cairn of Meall Garbh must win the prize for ugliest cairn I've been to. Has anyone seen an uglier one? 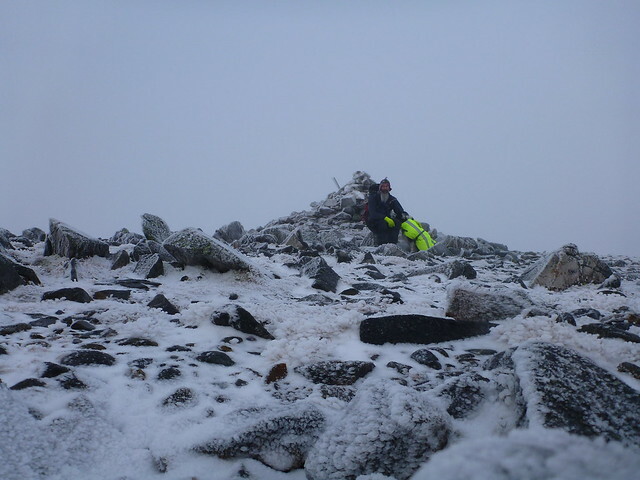 dogplodder wrote: But the summit cairn of Meall Garbh must win the prize for ugliest cairn I've been to. Has anyone seen an uglier one? I came across this image from a Russian Museum in the paper at the weekend - striking resemblance Apparently the ugly space junk is "art"! !